We are delighted to welcome Rosy Greenlees, OBE, as the Art School’s new Honorary Fellow, who accepted the title at our recent Prize-Giving Ceremony on 26 June 2018. The title of Honorary Fellow is awarded to individuals who have made outstanding national or international contributions to art, craft, heritage or materiality, education or pedagogy. Rosy joins Professor Roger Kneebone, the Art School’s first Honorary Fellow, who was awarded the title in 2017 for his pioneering work in fostering cross-disciplinary dialogues across craft, art, science and beyond. 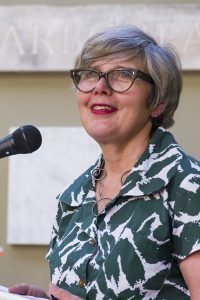 Rosy Greenlees, OBE, has been Executive Director of the Crafts Council since 2006. A national organisation promoting the value of craft and making to society, the Crafts Council has supported thousands of makers through its talent development programmes; brings high quality craft to an annual audience of over 6 million through its exhibitions, Collection and events; and leads a national campaign for re-instating craft education in schools. During her acceptance speech, Rosy emphasised the value of craft to the wider UK economy, particularly during the uncertain economic times ahead and she described the deep sense of satisfaction she has had in her work championing craft. Rosy went on to commend the Art School’s great success in keeping craft skills alive and relevant, and acknowledged the high standard of work the Art School achieves. She has also served on various advisory bodies including the Bristol and Bath Design Research Project, the Skills Commission; and was a board member of CC Skills. Currently she is a member of the Creative Industries Council and President of the World Crafts Council, a non-profit, non-governmental organization promoting fellowship and fostering economic development through income generating craft related activities. The WCC organize exchange programs, workshops, conferences, seminars, and exhibitions offering encouragement, help, and advice to craft practitioners. The Art School welcomes Rosy to our extended community of Fellows and looks forward to collaborating with her in the years ahead.